I have been posting to this blog for nearly three years and don't usually have a problem coming up with a topic but today I feel stumped. I could churn out some cheap filler, but I'd rather not compromise the quality of subject matter just because I'm past due for a post. As a result I'm going to try something that will give Chaka's World some flair and create greater appeal to the pop culture crowd. I've decided to extend an official invitation to Angelina Jolie, Michael Jordan, Jackie Chan, Tom Cruise, Arnold Schwarzenegger, Bruce Willis, and Halle Berry to be guest contributors on Chaka's World. You don't necessarily have to endorse my blog, I'm just looking for some short, heart felt posts by extremely famous people. If you happen to be a famous person and I neglected to list your name above, feel free to contact me and I will have my people check to see if I can schedule you in. If you happen to be a famous celebrity who is believed to be dead like Elvis or Bruce Lee, there could not be a better time or place to make your big announcement and I will move you to the top of the list. PS-If you are Brendan Fraser, Ron Howard's brother, Steven Seagal, or Miley Cyrus, you don't need to apply because there just aren't enough openings for everyone. 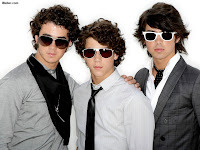 For quite a while I've heard people ripping on The Jonas Brothers, Miley Cyrus, Paris Hilton, Hillary Duff, Ashlee Simpson, Keanu Reeves, Tori Spelling, and other celebrities and accusing them of not having any talent. I couldn't name one song from any of these folks so I am not here to criticize their talent like Simon Cowell would. I'm just responded to what I keep hearing others say. Maybe it's true that many people who have made it big don't have talent, but they are sure making more money than I do (and that not only includes my regular jobs, but but my vast income from my blogging empire too.) By the way, Rupert Murdoch, Ted Turner, Richard Branson, and Bill Gates, my blogs are not for sale so back off with all of your lucrative offers! I'm sure there are many talented musicians, actors, artists, and athletes out there who could compete with or even do better than many of the stars of today. They probably just don't have the connections, a known name, or a way to market themselves. It makes me wonder what little things those who have become famous have done that the others haven't. I am not saying that being famous is the ultimate goal either. It's obvious that many celebrities have totally messed up lives even if they are in big demand by their industry. This topic also got me thinking about musicians who become actors. What is it with musicians who think that just because they can sing or rap, they belong in the movies? Even though this bugs me, I have to admit they have a pretty good conversion rate. Queen Latifah, Ice T, Snoop Dog, LL Cool J, Ice Cube, and other have all moved over into the movie industry. If I am ever going to be in a movie, I guess I should first become a rapper. I hope you don't feel disappointed with this blog title since I really didn't offer any ideas how to succeed without talent. I was just trying to boost the appeal and possibly the search engine rating of this post. At least I didn't call it "Justin Bieber adopted by Angelina Jolie". I was going to do a post on this subject a year ago after watching highlights from an Iron Man Triathlon contest. I kept noticing a disturbing detail. It was the strange look of the shirts the athletes wore when they got to the biking portion of the event. I have a friend who is a serious cyclist and when I asked him about this he informed me that they are referred to as "jerseys" not shirts. My little blunder reminded me of when I was in High school and girls would occasionally refer to our basketball uniforms as outfits, and our practices as rehearsals. So I apologize and will respectfully refer to them as biking jerseys from now on. 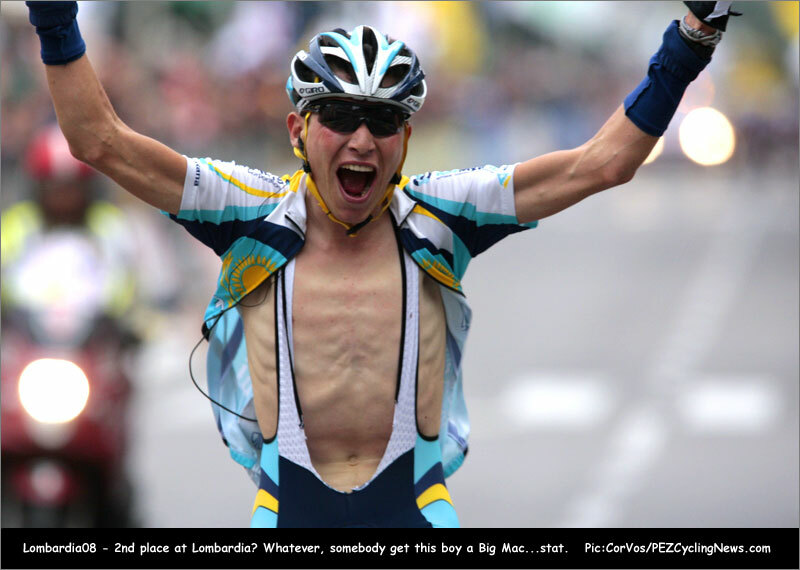 Anyway I was going to let this topic die, but just last week I saw a guy riding by my neighborhood who looked like he took a wrong turn at the Tour de France because he was all decked out like a real cyclist complete with the weird unzipped biking jersey. Biking jerseys actually look kind of cool, it's just when people unzip them that they freak me out.This is one of those things that I have a hard time describing. I just have a bad feeling about it, kind of like Donald Trump's hair. I can't really describe the look but it gives you the same feeling you get when you see a dead bird or mouse outside and you kind of jump back startled. By the time participants finish a race, many have their jerseys unzipped and it just looks weird and disturbing. I have spent far too much time looking for a photo that shows this, but I finally came across one. I understand the participants are overheating and looking for some ventilation, but there has got to be a better look for them than this. Is it just me or does anyone else agree? In honor of the World Cup tournament, I thought I'd post this picture. These guys are forming a wall for a penalty kick and are covering up some of their more vulnerable areas. 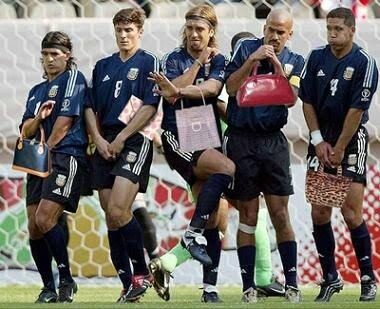 Someone photo shopped the handbags into the picture which gives it a nice look. I have a list of some different topics below. 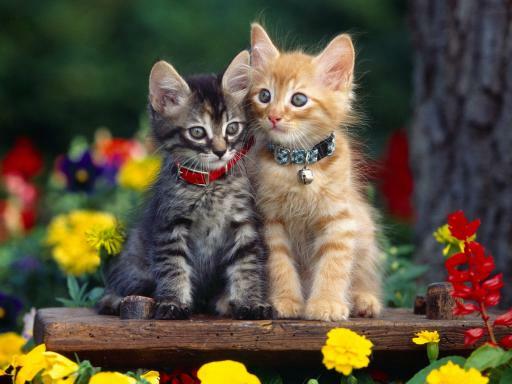 They may appear to be unrelated, but they all have some similarities. The biggest one is that I don't like what people do with these things to make them look aged, lived in, authentic, or blemished. Invitations- Whenever I get a wedding invitation in the mail, I examine the fancy paper the it is printed on. Occasionally it is ripped with jagged edges. When I comment on how they could have at least uses scissors to cut it out straight or used cleaner paper I am told that's the "fancy" way to do it. There is probably a name for that, but I'm not cultured enough to know what it is. I think sometimes the expensive paper looks worse than cheaper paper because of all the blemishes and unprocessed pulp or whatever is in it to make it look old and authentic. Furniture- Some expensive furniture has knots and holes in it to make it look natural and to give it an aged look. Many times these blemishes are intentionally made by the manufacturer. Why? I'm not trying to advocate shiny particle board furniture finishes but why not leave that nice door or desk as it was? You don't see car dealers putting chips and cracks in the windshields of new cars they sell to give them a more "mature" look. Clothes- People do the same with jeans. 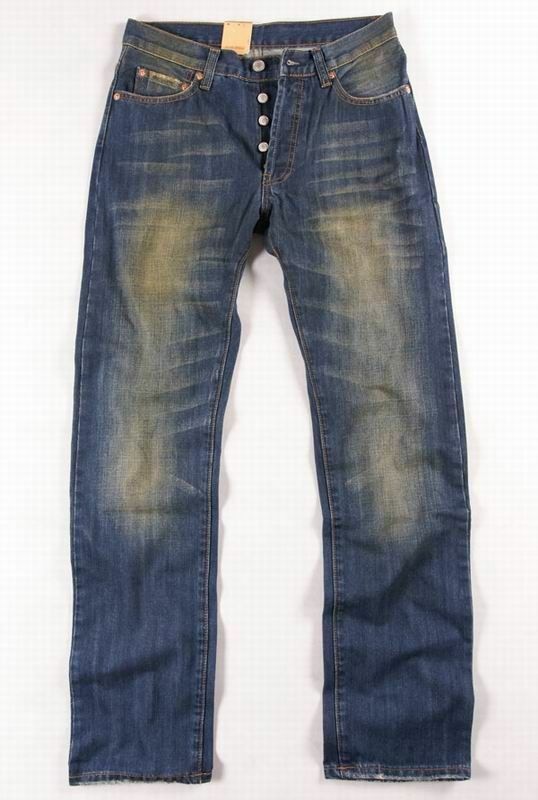 I recently bought some new Levis and had a hard time finding a pair that didn't look like they had oil poured on them and then were dragged behind a truck for several days. Even worse than the dirty look are the new jeans that already come with the rips in them. I know they are attempting to create a "lived in" look, but what is our obsession with making new stuff look old and crappy? Faces- I was about to express gratitude that at least we don't do this with our bodies, but then I remembered that some women use fake beauty marks too. I guess women think it will make them look like Marilyn Monroe or Cindy Crawford. I'm fine with natural moles and facial blemishes (unless the diameter is greater than a silver dollar or you can braid the hair coming out of it), but why put a fake blemish on your face? Food?- Maybe fast food places should pick up on this trend if it's so cool. They could put lipstick on your straw and use a punch shaped like a mouth to remove a bite of the hamburger before they give it to you. That way they could achieve the "been around the block" look that the public is apparently willing to pay for. I guess I'll just add this topic to the already huge category of things I just don't understand. The 80's was a great time to grow up. I think the best contribution from that time period was the music. I was recently thinking of heavy metal music and how it has gotten worse evolved over time. When I was young, the artists with the worst reputations and the heaviest style of music were groups like AC/DC, Iron Maiden, Ozzy Osbourne, and Motley Crue. Compared to the death metal groups of today, these bands were just pansies, pretty boys, or posers. As usual I think Strong Bad does a great job with his analysis of this genre of music. If you are not a Homestar Runner fan, don't click on that link. There is a lot of truth to it, but it is kind of obnoxious. In an effort to boycott the death metal genre, I am putting up a cute picture of kittens and flowers on this post instead of the scary demonic images associated with this music. Now if you will excuse me, I have to go listen to Death Reaper and their new hit single Bubonic Pustule.